SINGLE AVONRIDE TORSION BEAM AXLE FITTED WITH 203 x 40 KNOTT AUTO REVERSE BRAKES ON 4 STUD 5.1/2” PCD HUBS, RATED AT 800kg. KNOTT 750kg CAPACITY POSIBRAKE OVER RUN AUTO REVERSE C/W BREAKAWAY CABLE, SPRING ASSISTED HANDBRAKE LEVER, FITTED WITH 40mm EYE OR 50mm BALL. MOULDED MUDGUARDS, REAR SUPPORT STAND, TELESCOPIC FRONT JOCKEY WHEEL, FULL ROAD LIGHTING WIRED TO A 7 PIN PLUG. CYLINDRICAL IN SECTION WITH REMOVABLE TOP SECTION FOR TANK ACCESS. REAR ACCESS DOOR, FITTED WITH STAINLESS STEEL HINGE AND FULLY LOCKABLE. BUND CONTAINS 110% OF TANK CONTENTS TO HINGE LINE. CONSTRUCTED FROM TRANSLUCENT HEAVY DUTY POLYETHYLENE. 2” FILLER CAP & CHAIN. 1” VENT VALVE, 1/2”TOP MOUNTED SUCTION AND RETURN CONNECTIONS. P.R.V. SET AT 2PSI IN TANK TOP. 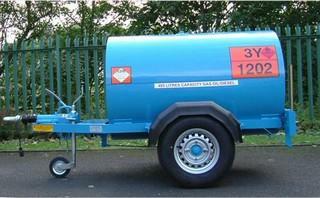 FITTED WITH K1 SEMI ROTARY PUMP, 15FT HOSE AND TRIGGER NOZZLE..
PRIMER & TWO TOP COATS IN SINGLE BRITISH STANDARD COLOUR. THE CONTROL OF POLLUTION (OIL STORAGE) ENGLAND ADR APPROVED.